2015 repress. 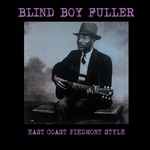 180 gram repro of the 1978 album from North Carolina's Blind Boy Fuller. Blues circa 1935-1939, including "Homesick and Lonesome Blues," "Truckin' My Blues Away," "I Crave My Pig Meat," "Walking My Troubles Away" and "Sweet Honey Hole."